I’m often asked what I’ve been working on lately, so I figured what better way to answer that than with a regular column about just that subject. For this entry, and I’m sure quite a few of my subsequent entries, I’ll be detailing some of the work I’ve been doing for Hasbro’s Marvel Universe line. This is a series of 1:18 scale action figures that will include the entire pantheon of the Marvel comic book universe. Basically, my dream line when it comes to making action figures. While I was not involved in the creation of any prototypes for the first wave, I did work on 3 out of the 6 figures in wave 2, and then 4 out of the 6 figures in wave 3. The quality of my team’s work on these has been very well received and we are now prototyping the vast majority of Hasbro’s Marvel Universe figures! While this is great news it is also a LOT of work. The Marvel Universe line debuted in stores on March 1st 2009 and the 6th wave is already starting to get worldwide distribution. At approximately 6 figures per wave that is 36 figures released in just 9 months! To really put this in perspective its takes us approximately 2 weeks to complete a single action figure prototype. Luckily we have been working on this line for a while now and have a nice head start. For this go around I’ll be spotlighting one of the most iconic Marvel heroes, Spider-man, in his 1980’s era black costume. 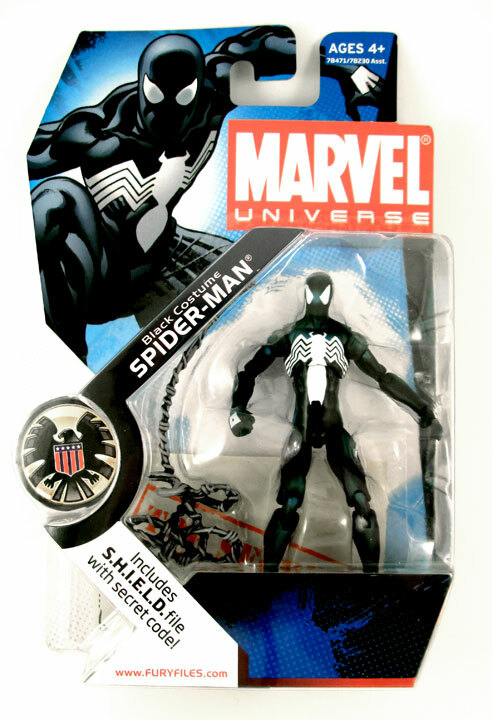 The black costume Spider-man is a part of Marvel Universe wave 3, which is currently available nationwide in the action figure aisles of Wal-Mart, Kmart, Target, Toys R’ Us, and local comic book stores. They generally sell for $7.99 and the line seems to be performing quite well at retail. I guess I’m not the only one that wants a superhero action figure that will fit in my pocket! On that note comes one of the first specifics I want to address about Spidey and really the line as a whole. Size. I mentioned earlier that the Marvel Universe line is 1:18 scale, what does that mean you ask? 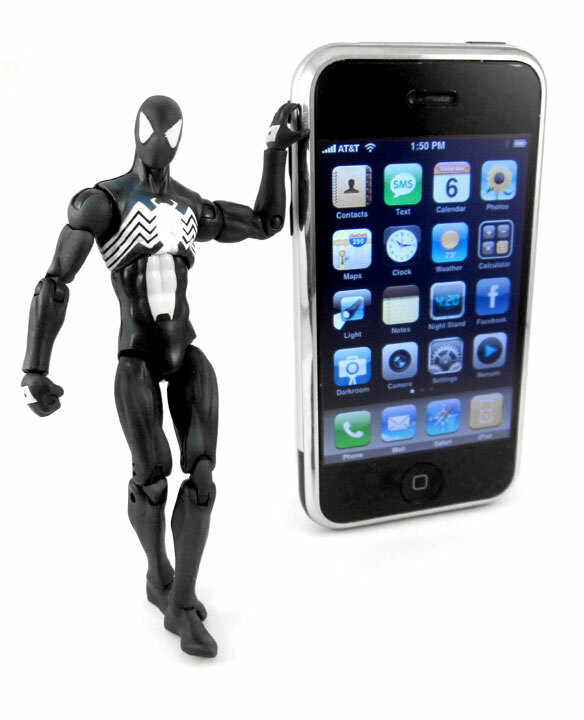 Well as you can see in the photo below, Spidey is just about the same height as an iPhone, around 4 ¼” tall, but far skinnier, black is slimming after all. What this boils down to is that Spidey here is approximately 1/18 of the size he would be if he were a real person like you or me. We sculpt the prototypes at actual size, putting the majority of the figures somewhere in the 3 ¾ – 5” range, so you can understand why all of my sculptors wear glasses. Another important point regarding the Spidey action figure and the Marvel Universe line is the articulation. 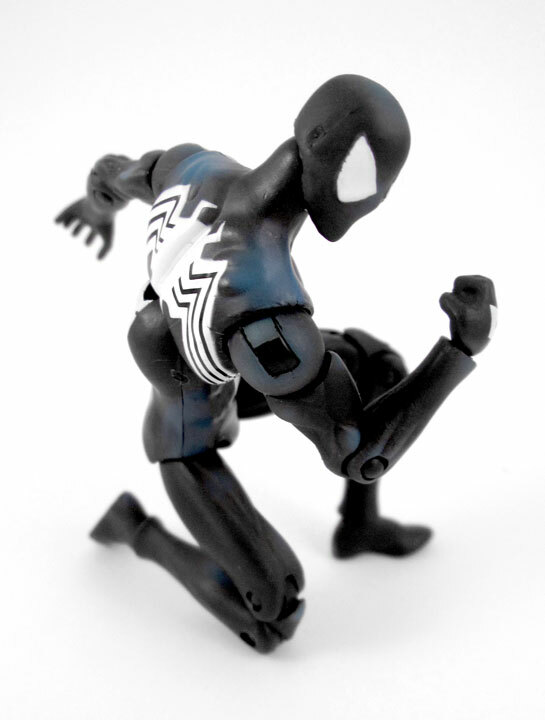 When we refer to articulation in regards to action figures we are not referencing their speaking abilities but rather their moveable joints that reflect the natural, or in some cases superhuman, movement that a body can have. Spidey has about 22 points of articulation that allow him to get into a ton of different poses. And finally, where my lifetime hobby really pays off, comic book accuracy. 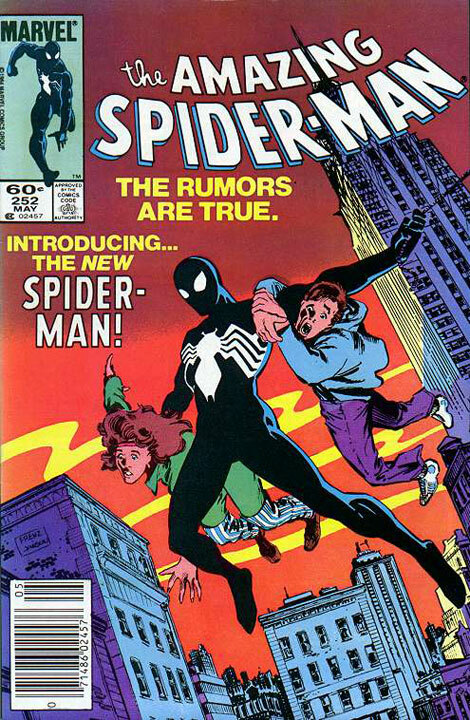 Spider-man’s black costume debuted on the cover of May 1984’s Amazing Spider-man #252, however the origin of how he acquired his new costume would not be revealed until December’s issue #8 of the twelve-issue limited series Secret Wars. 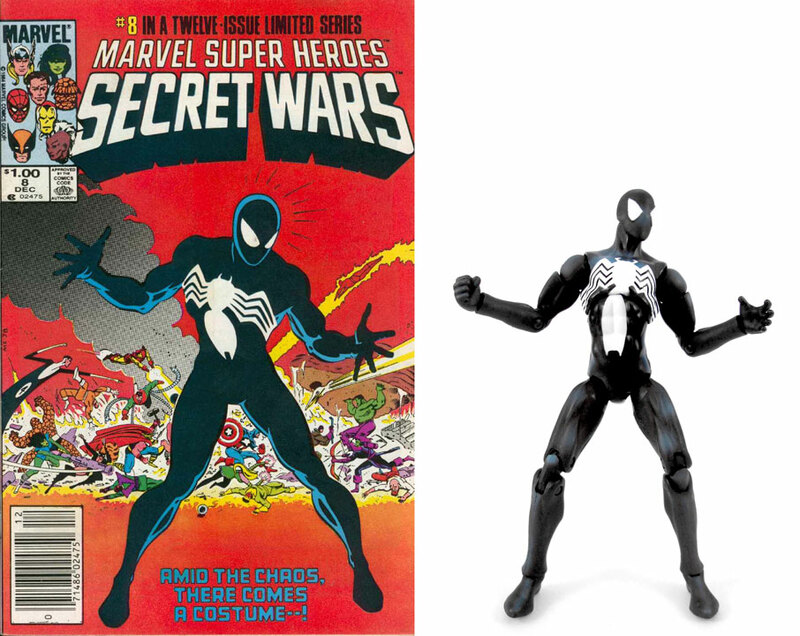 As you can see in these images, the graphic white on black costume is a dramatic change from the classic red and blue webbed costume. The fans embraced the new look and he has worn the black costume off and on for the past 25 years. I’m a big fan of the look of this costume and was super excited to have been involved in the making of this action figure, so much so that I have already bought 3, 1 for home, 1 for work, and 1 to keep in the package, and that doesn’t even count the re-release 2 pack that comes with an exclusive Magneto figure and a reprint of the Secret Wars #8 comic book!